I know I've been mysteriously absent the last few days! Life's taken a bit of a nibble out of my hind quarters and I've found myself needing to take a bit of a break while getting myself caught up. Sorry for the delay in posting. I look forward to being back Sunday or Monday! Know someone who likes the icky? 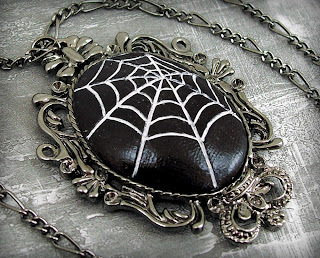 Do you have a friend you're shopping for that has a touch of goth to them? Today's shop could be the site for your shopping needs! When I first ran across today's site, it drew my attention because it took me a minute to realize I was looking at a picture of a necklace made of intestines. Okay, seriously, not really made -of- intestines but it was a clay sculpt of intestines made into a pendant. It was just a little gross... and just cool enough that I had to click and see more. When I clicked, I entered the world of Beat Black; a shop on Etsy "where the sweet and the sour co-mingle". Great catch phrase, isn't it? In this shop you'll find intestine necklaces and brain brooches, moldy bread cuff links and bone earrings all handmade from high grade polymer clay. Some of it's really, really cute. Some of it's on the weird side and there's a few pieces that are downright gross! All in all? It comes together into a shop that's so fascinating it's a page turner and you will be hard pressed to look away until you've seen every piece they have to offer. TO VISIT BEATBLACK ON ETSY, YOU CAN CLICK THE PICTURE ABOVE OR, IF YOU'D RATHER, CLICK RIGHT HERE! 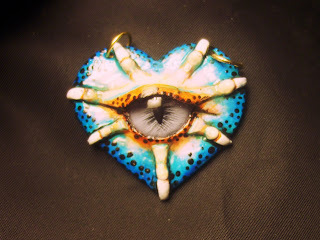 Eyes are the Windows of the Soul ~~ Sometimes I come across something in the handmade marketplace that just surprises the heck out of me and today's shop was one of those. I go to metaphysical shops off and on all the time and you see dragon figurines and other mementos of that line at nearly all of them. I never really thought much about the artists behind these pieces because in most cases, they're mass produced. I guess that somewhere along the way I became jaded to the mass produced items, because when I came across today's shop it was a reminder that there are truly talented and amazing artists behind all those pieces somewhere at their birth. That somewhere in the past there was an artist who created the piece that caught the retail market's attention. These pieces are each one of a kind. Each and everyone is an artist's hand-crafted expression and lovingly sculpted and painted with care. Some of them are so life-like that they can easily be gazed upon for hours in fascination. 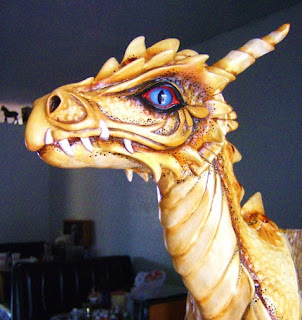 I'm personally both impressed and mesmerized by the eyes in these pieces. Their eyes are so realistic it's as if each piece has it's own soul. It's so rare to find such a stunning feature displayed so beautifully as you will in these pieces. If you love dragons, unicorns and other mystical creatures or if you know someone who does, I strongly encourage you to check out Misty's Creations and take a browse through their shop. I am so very, very impressed and I think you will be too! TO VISIT THE MISTY'S CREATIONS SHOP ON ETSY, YOU CAN CLICK THE PICTURE ABOVE OR, IF YOU'D RATHER, CLICK RIGHT HERE!